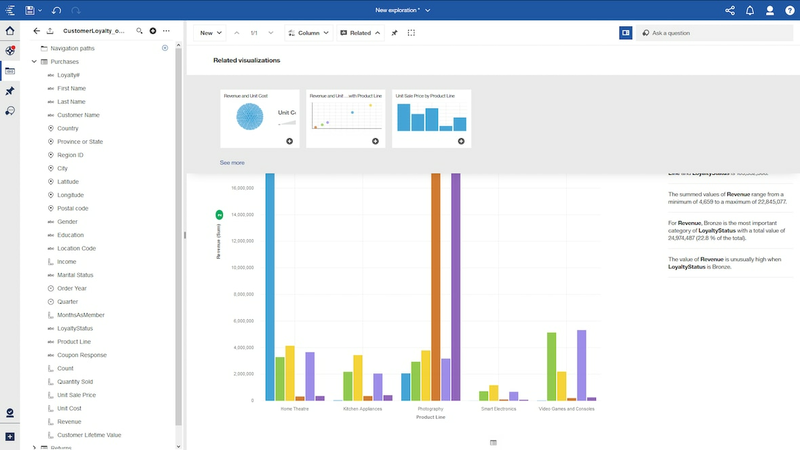 IBM® Cognos® Analytics on Cloud offers smarter, self-service capabilities so you can quickly gain insight and act on it. The solution empowers business users to create and personalize dashboards and reports on their own - while providing IT with a scalable solution that is available on premises or on the cloud. Provides a unified always-on BI experience across web or mobile devices, enabling you to quickly find, analyze, create and share insights. Ensures more users have straightforward, productive and governed access to data. Benefit from a guided and intuitive experience that lets you create visualizations, infographics, dashboards and reports in minutes. Provides access to curated BI data that can eliminate risk and debate over numbers.